For the very first time in many, many months, V readings dropped by 60 points to 3140. As we are still several hundred points above the extreme line, this small downward move will not have much of any impact on market volatility. However, as long as the weekly trend is up; this strong pullback probably present one more buying opportunity, but one that might have a short time line. There is no doubt that some sectors will get whacked more than others and in the process some of our stocks will hit their stops. The main thing to remember is that if the stock is great we can always get back into it and do so at a much lower price. A very good example is Vimpel communications (VIP); this stock is a screaming buy from a very long term perspective (minimum time frame 2 years). The trend is now negative on the daily charts but that is still not a big deal as the weekly trend is still positive. 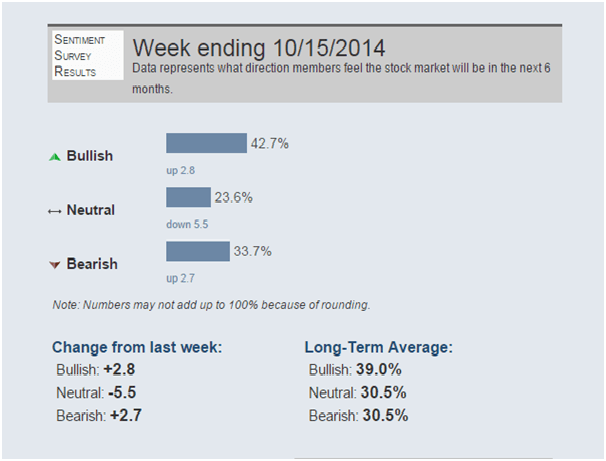 Until the weekly trend turns negative the overall outlook will remain bullish. The monthly trend has also turned negative so this now means that volatility levels will remain high unless the weekly trend matches the monthly trend or the monthly trend reverses to positive. In the interim the most likely outlook is a strong pullback (and the market is currently experiencing one) followed by a strong counter rally; this began on Friday so let’s see how long it lasts. If the market should rally to new highs and the monthly trend does not change then we can expect a pretty dam strong correction to take hold once the weekly trend turns negative. Always remember that our trend indicator has nothing to do with the drawing of trend lines. For example, the trend could turn negative when a market is trending up (based on trend line that is moving upwards). This would indicate that a top is probably close at hand and vice versa. The current correction appears strong but it really is not; the market has not experienced any meaningful correction for at least 3 years. Thus a 10% plus correction is almost warranted and one need not panic if this comes to pass. The only time we need to be concerned is if the weekly trend turns negative. The Russell 2000 bottomed out on the 16th and the daily trend is close to turning positive; the pattern is also rather bullish. Small cap stocks topped out well in advance of the large cap sector and now it appears that the small cap Russell 2000 is bottoming out. . Once the daily trend for the market turns positive, we can expect the markets to rally strongly to year end. Historically October is known as the bear killer month; while some of the worst pullbacks take place on this month, in nearly all the instances the market reverses and starts to trend higher. Given the weekly trend is up and that we have a bunch of supper corrupt officials in charge, the path upward is the more likelier path at least for now. This fake bull market is the only thing that makes it appear that all is well in this economy. While major indexes including the S&P 500 and Dow Jones industrial average sustained huge swings that resulted in comparatively modest losses, the Russell 2000—the primary index for small caps—had risen an impressive 3.7 percent as of Friday morning trade. The iShares Russell 2000 ETF pulled in $2.93 billion of investor flows for the week, the most of any fund and more than triple its closest competitor, the Energy Select SPDR, which saw inflows of $766.1 million. Full Story . We stated not too long ago that a market cannot trend higher only if it is being led by the large caps (long run) and so this turn around in the small cap sector appears to indicate that markets want to run a lot higher as money is now flowing into this once ignored segment of the market. The latest AA sentiment report reveals that there are still more bears when one combines the real bears with the neutrals (bears without teeth). 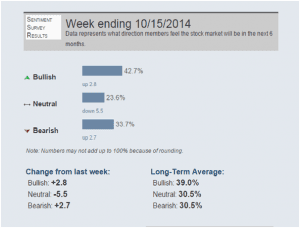 Bears and neutrals add up to 56%, which is far higher than the total number of bulls. The long term average of bulls stands at 39%, while the combined figure of bears and Neutrals stands at 39%. This suggests that the market has more room to run higher. The index has pulled back nicely since its peak in September and is attempting to put in bottom. This is a contrarian indicator so lower numbers indicate that more brokers and dealers are turning negative. Remember markets climb a wall of worry and fall down a cliff of joy. So when people are scared and worrying it is good for the markets as long as the trend is up. Additionally, the VIX experienced a huge move up last week, indicating that fear levels were soaring. The index is hovering right around support but we would not be surprised if the Index dropped down to test the main uptrend line in the 158 ranges.